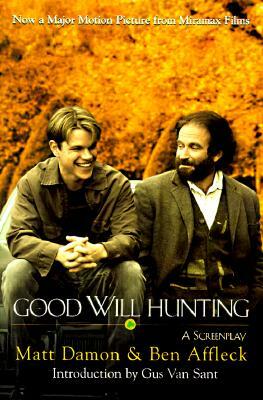 As director Gus Van Sant observes in the introduction to Matt Damon's and Ben Affleck's screenplay Good Will Hunting, the two young actors somewhat resemble the characters they play in the film: they're best friends, and Affleck (who plays Chuckie) habitually chauffeurs Damon (Will), who doesn't drive. Van Sant says we can see how badly Damon drives by watching the film's last scene, in which he is actually driving the car with the camera mounted on it. But Damon and company write better than he drives; this script contains some of the boldest, best monologues since Pulp Fiction.Van Sant and cast member Robin Williams helped the young actors tame the tigers in their cranial tanks, trimming the script into a precision instrument. Though the stills from the film are not perfectly matched to their places in the script, this story remains as much a joy to read as it is towatch on the big screen. Keywords: Hollywood. Film. Screenplay. Boston. Cambridge. MIT. South Boston. Matt Damon. Robin Williams. Ben Affleck. Gus Van Sant.